Lovely first floor condo in sought-after Beach Plum Condominium. Walk to Village of Harwich Port. Features updated kitchen, hardwood floor, laundry on main level, sunny east-facing lanai and newer FHW heating system. Deeded parking space very close and visitors parking nearby. Condo fees include gas heat and hot water, basic cable, water, trash/recycle and snow removal, landscaping, building insurance and more. We will be delivering all the toys tomorrow, Friday to the Lower Cape Outreach Council. 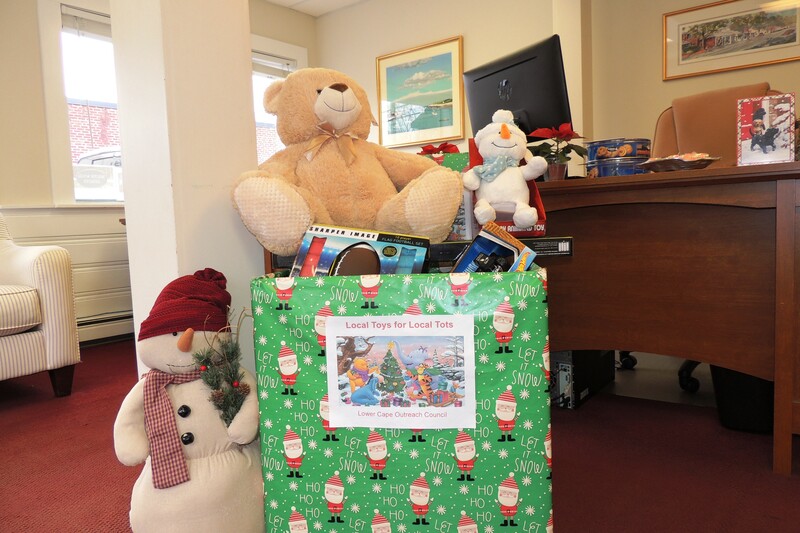 If you wish to donate please drop off your unwrapped toy to our office 566 Route 28 Harwich Port. We are happy to pick up if that helps. Thank you for all the generosity! • 2 bedroom, 1.5 bath Cape style home – FOR RENT $2,200 per month. Fabulous well maintained Cape style home set back in the woods. Enjoy the beautiful privacy in your screened in porch or morning coffee on the second floor deck overlooking the woods. Large living room with gas fireplace, dining room with window looking out into the woods beyond. Galley kitchen with good counter space, gas stove and washer and dryer. The large master bedroom features wood flooring and gas fireplace, On the second floor you will find a good sized bedroom with lots of skylights and access to a spacious second floor deck. There is also a half bath with large closet and small office area. There is a good sized outside shower, front deck and walk-out basement. You will enjoy the gorgeous details and charm throughout. First, last and security.